Medium-sized, stocky, short-necked duck. Chestnut-brown head, yellow forehead, pinkish grey breast of breeding male distinctive; also, grey upper body, black stern, white forewing. 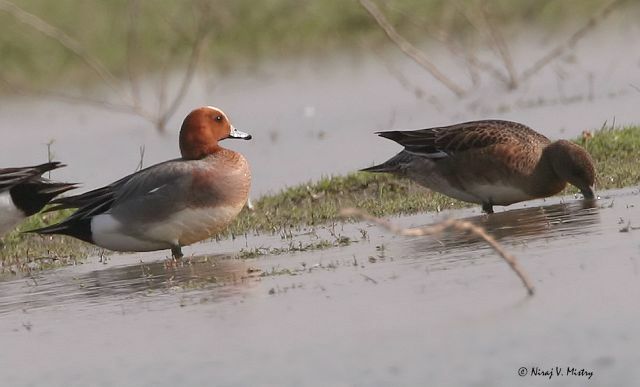 Female and eclipse male have plain grey-brown plumage, though male more russet. Both sexes have pale grey black-tipped bills. In flight, all plumages show white belly, pointed wing, pointed tail, dark specula. Gregarious; often in mixed flocks. Rivers; fresh and salt water lakes, marshes and swamps.